The moorish idol (Zanclus cornutus) is one of the most strikingly beautiful fish to be found. In its natural habitat it is usually found in groups of 2-3 and so if you have one, it is probably best to get another. It reaches a size of about 9 inches (23 centimeters). It is a peaceful fish that should only be kept with other fish that are also peaceful. Unfortunately, moorish idols are difficult to keep alive in captivity. Beginners should definitely avoid this fish. One problem is that it is difficult to find it appropriate food in the aquarium. In the wild, it feeds on reef invertebrates and live sponges. 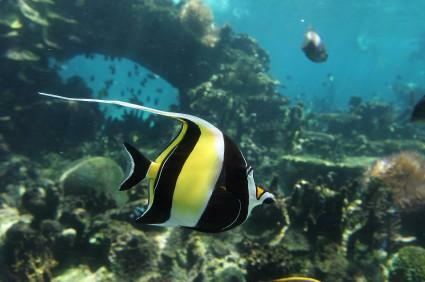 If you plan on keeping this fish you will need to have live rock with invertebrates on it for your moorish idol to eat. You can also attempt to supplement its diet with vitamin-enriched brine shrimp and sliced squid. If you keep it in a reef aquarium it may be able to eat invertebrates off of the reef as it would do in its natural environment. Keep in mind that even experienced saltwater aquarist have trouble keeping this fish alive in captivity. This fish may be best left in its natural environment where it can flourish. Remember, it isn't just the cost of these fish if they don't survive, but the loss of life. It is cruel to bring them in captivity knowing that they probably won't survive. Incidentally, when I was a child my family and I were fishing in the ocean and my mother caught what I believe was a moorish idol, unless it was a banner fish, which looks almost exactly the same. I can remember getting the camera out of the dry bag sack to take a photo of it because the fish was so elegant and interesting looking. My mother threw the fish back into the ocean right after she unhooked it from the fishing line so hopefully it lived. Since the banner fish is so similar in appearance to the moorish idol, and is MUCH easier to keep alive in captivity than the moorish idol, it is best to keep a banner fish in your aquarium, rather than the moorish idol. The banner fish (Heniochus spp.) is one of the easiest fish to keep in captivity. It is a beautiful fish and will eat most types of marine aquarium fare (vitamin-enriched brine shrimp, frozen food, plant matter, and crustaceans). However, if you keep them in a reef tank they will sometimes eat the inhabitants. The species of banner fish that looks most similar to the moorish idol is the longfin bannerfish (Heniochus acuminatus). They are peaceful fish that should be kept in a small shoal. They do well with a slighly alkaline pH and a water temperature of about 72-78 degrees Fahrenheit or 23-26 degrees Celsius. 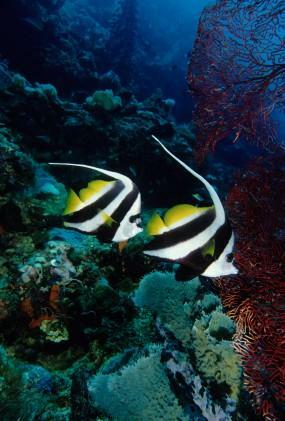 If you like the appearance of the moorish idol then get a banner fish instead. You will be saving the life of the moorish idol that is not brought into captivity, yet you'll get the same beauty and grace with the banner fish. Copyright © 2008-2019 AboutFishOnline.com. All rights reserved. Moorish Idol and Longfin Banner Fish Images from istockphoto.com and may not be copied.